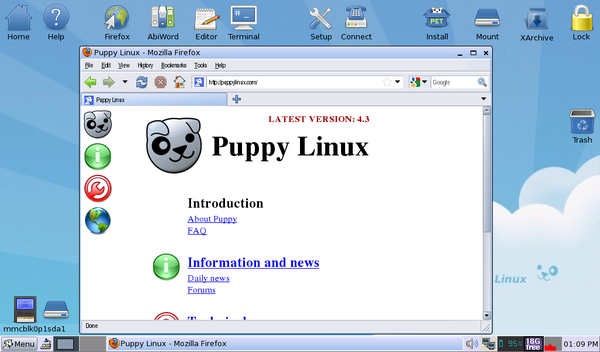 SeaMonkey, the default browser in Puppy Linux, is good, but what if you prefer Firefox? No problem, it takes only a few simple steps to install your favorite browser onto Puppy Linux. Launch then the Rxvt terminal and run the firefox command. Instead of launching Firefox from the command line, you can create a desktop shortcut. To do this, drag the firefox script in the firefox directory onto the desktop. To change the generic script icon, right-click on the shortcut, and choose File -> Set Icon. Drop then the desired icon onto the dialog window (you can find a large collection of ready-to-use icons in the /usr/local/lib/X11/pixmaps directory). That's all there is to it. Linux is not for those guys who just wanna sit on a comfort seat and want everythin. Its only for those guys who like to work a bit and like their work being paid off. I don't like people with an attitude like u sit wherever u r, get something fully furnished and only get surprises for the rest of your life. Its for those people who want to get started in programming if they are really interested in it. I had worked with a dos os [win xp, vista, 7] and came to a conclusion that its pure eye candy and your world just revolves within windows. Just because of eye candy and increased graphic options, they have more game programmers attracted towards them. To the guys who like to workin in windows - Linux brings u forward the to the real world and programming. Linux is developed by non-profit organizations unlike Microsoft[where the pure intention is profit]. U must try and appreciate their work and respect them unlike cursing them for any of their mistakes. If u fail to do so, I'd say - just bug us off. I appreciate the work done by the article writer for taking a part of his valuable time for writing this article and I surely encourage you to continue doing so to help the ones who are beginning to explore Puppy Linux. And I do appreciate the work done by the Community in successfully creating a functional website to help the needy. just a small point that you would think that the would look at... but no. another thing is, when you expect people to enter a code, you should at least make it legible. A bunch of squiggles and other crap is displayed and you expect someone to enter some sort of code ? What a completwe and utter joke, you guys are insane. You linux guys just dont get it do you. all this command line stuff is BOLLOX. You just live in a little world of your own with bits here and switches there... getting nowhere. Cannot get the script to run. have to start firefox through the terminal? Another and maybe easier way would be to use the PET Package for Firefox. But the package is for Firefox 2.0.0.7 that is quite dated. Aren't there some libaries you'll need to install? I remember there being something about ssl needing a library to work but can't remember exactly. Anyway thanks for the instruction, it's better than searching murga-linux/puppy for the latest .pet.